100% analog vintage-style chorus and vibrato. 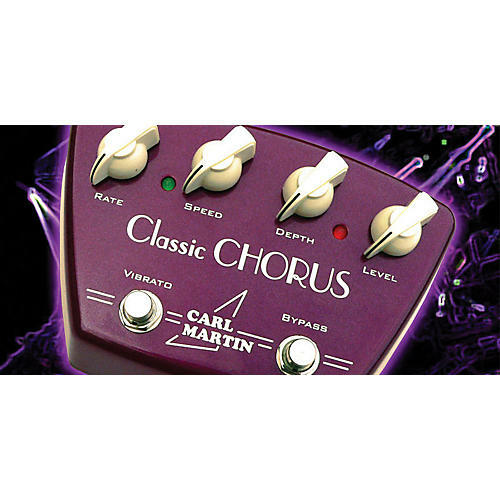 Housed in die cast metal bathed in retro purple, the Classic Chorus Pedal by Carl Martin offers level controls for Speed, Depth and effect Level. Hit the Vibrato switch and the Rate knob blends between Chorus and Vibrato. Round, warm, vintage chorus and vibrato swirl out from this pedal thanks to the absence of compander circuitry. Companding does smooth things out, but it can also cause the loss of fullness and responsiveness you find in older effect pedals. Carl Martin believes you and your audience can handle the big round sound this little baby puts out. You know it's going to sound fantastic. Why wait? Call us or click to order now.